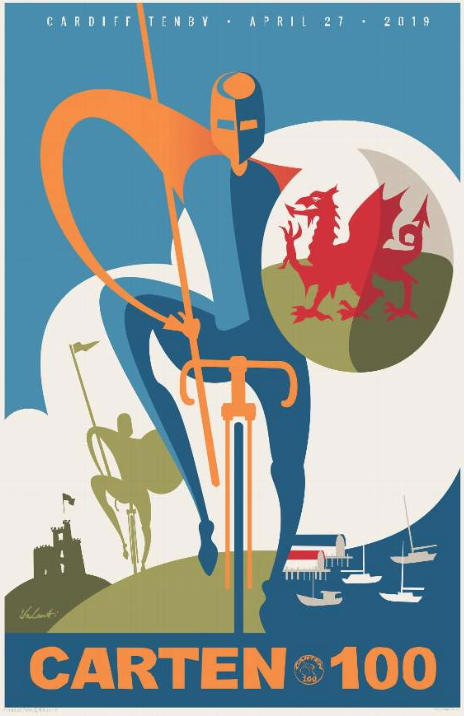 The CARTEN 100 is an epic 100 mile cycle ride from Cardiff to Tenby held annually. This year’s event, which will be held on Saturday 27th April, is themed ‘Riding Out Taboos’ and aims to raise funds and awareness for taboo areas of health for men and women. Prostate Cymru is one of the nominated charities along with Jo’s Cervical Cancer Trust. Established in 2004 by a small group of friends, the CARTEN 100 is a leisurely bike ride that takes place over roughly ten hours and has raised over £1 million for Welsh charities since its inception. The event is a not for profit venture run by volunteers so that its nominated charities can benefit as much as possible. The ride, which takes a fairly direct route using A roads, B Roads and cycle routes, is a challenge but organisers stress that it is not a race or competition. The ride starts at around 7:30am at Cardiff’s iconic City Hall. It will be a rolling start with cyclists setting off in groups of fifty. The event is suitable for all cyclists and has a great, friendly and supportive atmosphere. Participants will complete the ride at the harbour in Tenby. Entry for the 2019 CARTEN 100 is from £85. This price includes the entry fee, a 2019 cycle shirt, a finishers t-shirt, feed stations along the route and a meal at the Size of Wales Pavilion in Tenby Harbour at the finish. The CARTEN 100 is an extremely popular event so if you would like to take part you must be quick! You can sign up via the online entry form.